Our Healthy Zucchini Tortillas Recipe is for healthy low carb tacos and or burritos. 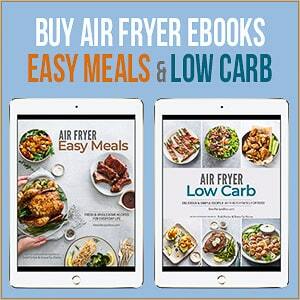 Mexican food can be lighter and less carbs! Love tortillas without all the starch and carbs? You’ll obsess over our low carb zucchini tortillas recipe! 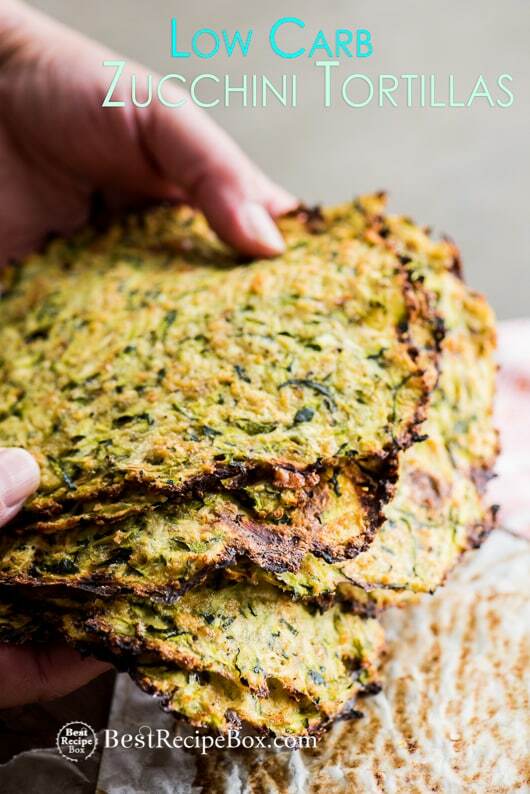 Seriously this recipe for zucchini tortillas is mind blowing because it’s made with grated zucchini, which is why it’s so much healthier than regular flour and corn tortillas. We love eating soft tacos but sometimes too many of the flour or corn tortillas are loaded with carbs. Instead, we can eat tacos and soft tacos with less guilt by using zucchini tortillas. These zucchini tortillas are loaded with flavor, without all the carbs and definitely worth trying because they’re even delicious on their own. Seriously, if you just tasted one of these tortillas, you’ll understand what we’re talking about. They’re super delicious alone as a snack or as a zucchini tortilla wrap with hummus or what ever you want. The flavor comes from the spices and some parmesan cheese. 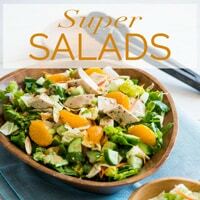 Everyone who has made this has said it’s great for a paleo or keto lunch. 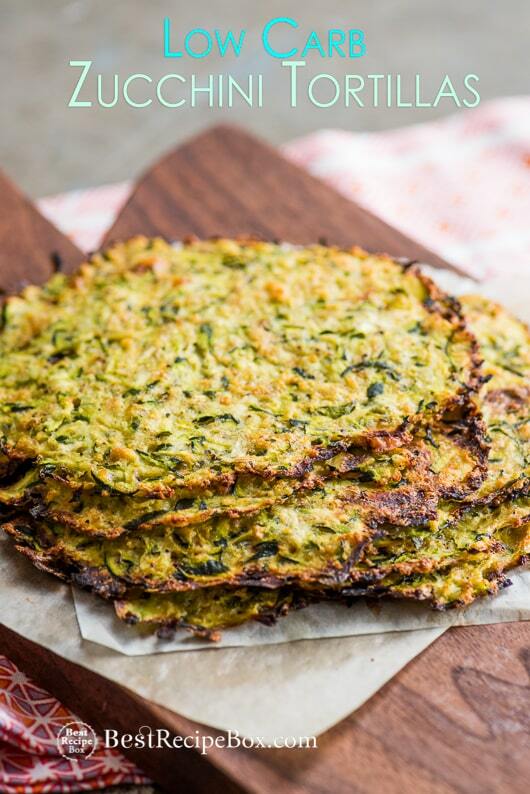 This healthy zucchini tortilla recipe is a great paleo recipe or keto recipe when you’re wanting to eat less starch and more vegetables. 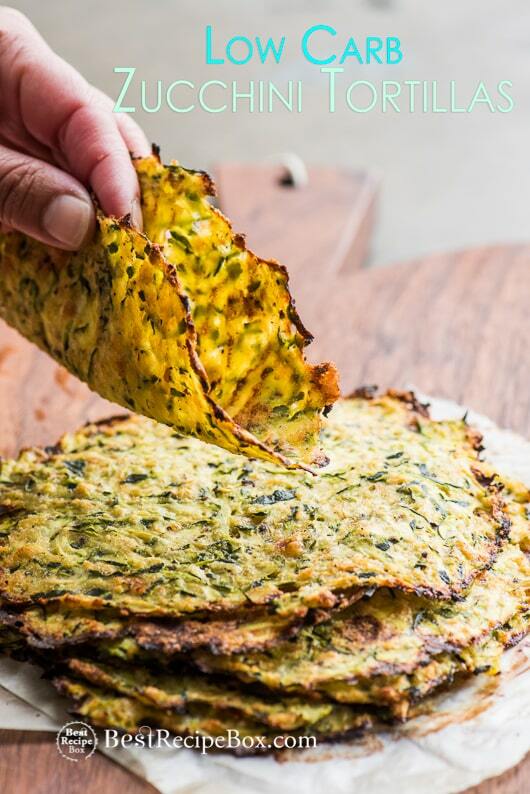 Watch our amazing Healthy Zucchini Tortillas Recipe being made! 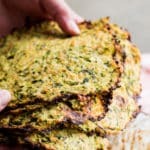 This healthy zucchini tortillas recipe can also be adapted to using different types of flours and it has worked great. Just make sure to spray the parchment paper first to avoid the tortillas from sticking too much. 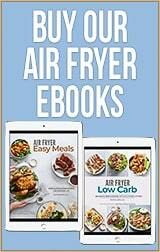 You can make some of the best low carb and healthy tacos. You can make fish tacos with these healthy tortillas and they’re fantastic! Like we said before, you can also just eat them as a snack. 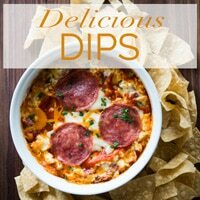 If you want you can even add some tomato sauce, pepperoni and cheese on top. Then broil them for a few minutes to make a fantastic low carb pizza with a zucchini pizza crust. The fun possibilities are endless and we’re still not tired of devouring every single batch of zucchini tortillas that we make. 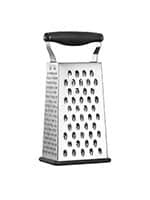 Box Grater – Every household needs a solid grater. Here’s one of our favorites! 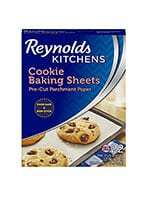 Pre-cut Parchment Sheets – The rolls of parchment paper will always work, but the pre-cut sheets are our favorite. 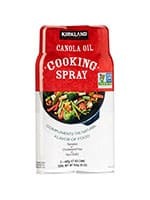 Cooking Spray – We used to make them without the spray. Peeling the tortillas off wasn’t fun. Now-a little spray and everything is easy-peasy! It’s like magic. 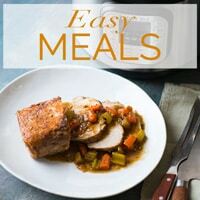 This recipe can also be adapted to using different types of flours and it has worked great. Just make sure to spray the parchment paper first to avoid the tortillas from sticking too much. 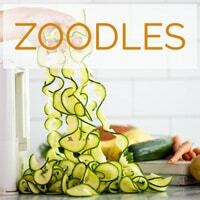 Squeeze out as much excess water in the grated zucchini as you can. This will make the taco shells a little more “firm”. You can microwave the zucchini to release excess moisture, then squeeze out the water with paper towels. Or lightly sautéing the zucchini for a few minutes, then squeezing out the water. Don’t cook the zucchini too much or use or else you’ll get mush. Pre-heat oven to 450° F (230°C). Line 2 baking sheet pans with parchment paper and spray with non-stick cooking spray. Set aside. Remove as much moisture as you can from the zucchini. Add zucchini to large bowl and mix in remainder of the taco shell ingredients (egg, parmesan cheese, bread crumbs, black pepper, salt, garlic powder, and cumin). Scoop about ¼ cup (60ml) of mixture on one of the prepared baking sheet pans and press down into a thin circle, about 5” wide. Repeat for remainder of mixture. Bake shells for about 22-25 minutes, or until the shells look “crisp’ and brown around the edges. We like to bake the shells a little longer for a more charred texture and flavor. Just be careful to not bake too long or else the shells dry out and are hard to peel off. After zucchini soft taco shells are cool, gently peel them off the parchment paper. Serve with your favorite taco fillings. 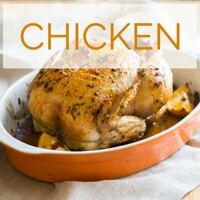 Can you use anything besides bread crumbs, a gluten free alternative? I can’t have gluten could you sub almond flour for bread crumbs ? Sure the almond flour should work ok. Please let us know how your almond flour results were so our readers can try it next time! Ian’s (made by Elevation Brands, LLC) makes Gluten Free “pinko Breadcrumbs” that are available in grocery stores in Chicagoland. Hi Linda, yes we’ve frozen them before and they are still delicious. The texture might be a little more crumbly, but when we thawed them the shape and flavor still help up really well. I ate them like a cookie. I did add some dried chopped onion. I would have added fresh onion, but I was too lazy. I had to refrigerate it uncooked overnight without the egg and breadcrumbs. When I added the two ingredients, they cooked up perfectly. Can the cheese be omitted? Is parmesan cheese necessary or for flavor. I can’t have it. Thanks. How long do these keep? Can I make them to use for several days? We’ve kept them for up to 3 days in the fridge. We also froze them and even after 10 days, they thawed out well. Just microwave them for a few seconds to warm them up! Would you please give nutritional info? Also, instead of bread crumbs a good substitute would be ground up pork rinds.